Lux Arati performs together with fire for the first time at PEX Summer Festival 2011 with The Russian Roulette Variety Show. 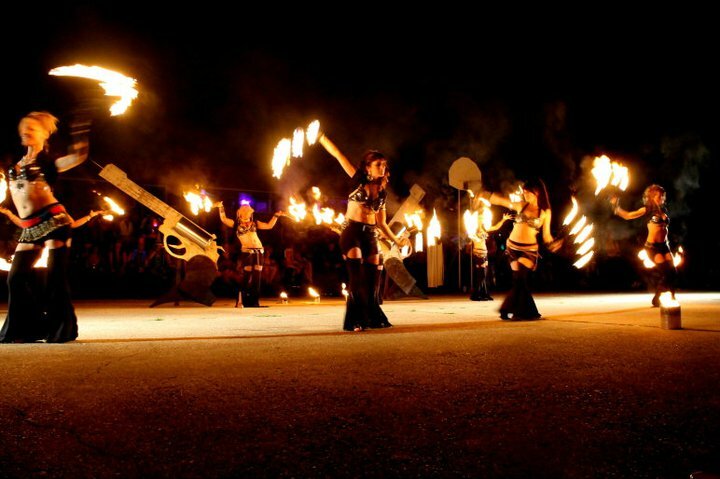 Lux Arati is an all-female bellydance & fire troupe based out of Philadelphia. Blending influences of American Tribal/traditional Middle Eastern bellydance styles, modern dance, hip-hop/liquid/flow dance styles together with tech and flow fire spinning (fire fans, fire fingers, palm torches, fire hoop, fire staff and more), the lovely ladies of Lux Arati are a powerful, hypnotic presence. Combining group choreographed pieces with improvisation-style Tribal bellydance, Lux Arati draws upon the strength of each of its members personal dance and fire performance styles to create an electrifying showcase for their audience. While most of the members of Lux Arati have been performing together on stage since the summer of 2010, they debuted their first official fire performance under the name “Lux Arati” in July of 2011 at PEX Summer Festival, in Darlington, MD, as part of The Russian Roulette Variety Show.